Most people have some sort of hair that they dislike or are embarrassed by. Most people also think there are only a few imperfect ways to care for that hair. Some people tweeze and others wax. Other people shave or do nothing. At Individual Expressions we settle for those as options. Not to say that tweezing and waxing are bad choices, but we believe that there should be a simple way that is permanent. That is why we offer state-of-the art electrolysis right here on Staten Island. Hair removal is a very intimate and personal thing, and we treat each client with nothing but respect and professionalism. Each of our employees is highly trained, and they know that each person has different hair and different skin. For thick hair to be removed more time is required, and different measures are taken for thinner and course hair. Each of our clients goes through a consultation, so that we can give you an accurate timetable and pricing for stopping your unwanted hair dead. Don’t feel you have to live with monthly waxing appointments, because that isn’t the case. At Individual Expression we have one mission and that is to make you comfortable with your look again. We want to help rid you of your self-consciousness about your unwanted hair. For both men and women, we can help get rid of hair almost anywhere. 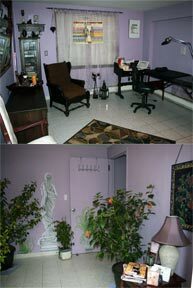 We provide a comfortable atmosphere that will you feel at ease when you walk into our office. Whether you are looking to have your eyebrows touched up or you want to get rid of the hair on a mole, we are the place to visit. Give us a call and see how we can help you today.